FourSquare and Harvard - a tipping point? FourSquare is location based social networking (with gaming functionality.) Users have the obligatory friend lists / connections and then 'Check In' announcing their location. Thus when you arrive at work / coffee shop / bar / cinema etc, you 'Check In' to FourSquare. There is also gaming functionality that awards uses points for each Check-In and repeated Check-In's at the same place can see a user crowned 'mayor' of that location. As an individuals' usage of FourSquare increases there are badges to unlock and leaderboards to feature on. There is also the functionality to message friends and leave comments / tips for the wider audience about particular locations. In the words of the New York Times: "A combination of friend-finder, city guide and competitive bar game, Foursquare lets users “check in” with a cellphone at a bar, restaurant or art gallery. That alerts their friends to their current location so they can drop by and say hello." Other social location services have tried to harness this sort of idea, like Dopplr and Google Latitude, but FourSquare's real time blend of friends, 'Check-Ins', tips and game play seems to be a winning formula. The FourSquare Harvard partnership plays on all of these elements. Harvard is the first University to work with FourSquare and aims to 'help students explore their campus and surrounding places of interest.' A Harvard Yard badge can be unlocked and displayed on users' profiles and there is a belief that FourSquare can help students and staff engage in new ways. Indeed, Perry Hewitt, director of digital communications at Harvard is quoted in the Harvard Gazette as saying “Harvard is more than classrooms and buildings. It is an interconnected community of people, ideas, and experiences, and we are actively pursuing ways to enhance those connections." FourSquare now has the potential to be a real feature in Harvard life and this could be the beginning of the many small close knit groups that Gladwell refers to. Harvard was the birthplace of Facebook and Harvard adoption of Facebook helped push it into other colleges which in turn fuelled the global Facebook phenomenon. On top of this public partnership announcement, FourSquare is also integrated with Facebook and Twitter. FourSquare Check-In's and activity are relayed to Facebook walls and Twitter profiles, making FourSquare even more visible and likely to spread. 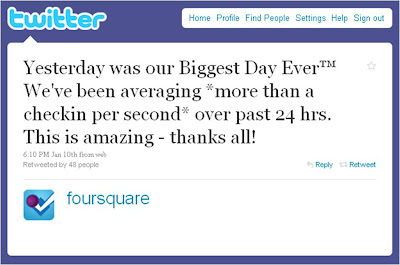 The advertising opportunities are more obvious with FourSquare than they are with Twitter. As the service is tied to locations and real world businesses, there is a huge opportunity in couponing and real time messaging to users (with virtual gifting or advertiser badges other potential revenue streams.) Indeed, this is also the thinking behind Google's proposal to include real time, location specific ads into Street View.